1. The “courage of hopelessness” is, perhaps ironically, an optimistic position. The publicity blurbs for Peter’s talk stated that he would offer “a way to steer a course between the two closely related traps of hopelessness and utopianism.” This is a misreading of my use of the term “courage of hopelessness,” which is a position of some great optimism. We need Utopia / utopian thought more than ever because we live in a time without alternatives when neoliberal capitalism reins triumphant and uncontested. The so-called global free market works well for the One Percent, but not for rest of humanity. In my talk, I provided some examples of the ways in which capitalism trumps democracy (pun intended). The hegemonic system of global capitalism dominates not because people agree with it; it rules because most people are convinced “There Is No Alternative.” Indeed, as I have argued, the dominant approach to schooling and curriculum, particularly in social studies education, is aimed at indoctrinating students into this belief. Utopian thinking allows us to consider alternatives, such as the pedagogical imaginaries which I presented in my January seminar, in attempt to open up spaces for rethinking our approaches to learning, teaching, and experiencing the world. And these imaginaries are necessary because traditional tropes of social studies curriculum (e.g., democracy, voting, democratic citizenship) are essentially lies we tell to ourselves and our students (because democracy is incompatible with capitalism; capitalist democracy creates a shallow, spectator version of democracy at best; democracy as it operates now is inseparable from empire/perpetual war and vast social inequalities). What we understand about the world is determined by what the world is, who we are, and how we conduct our inquiries. Things change. Everything in the world is changing and interacting. When studying social issues we should begin by challenging the commonsense ideas of society or particular social issues as a “thing” and consider the processes and relationships that make up what we think of as society or a social issue, which includes its history and possible futures. Inquiries into social issues help us understand how things change and also contribute to change. This approach raises important questions: where does one start and what does one look for? The traditional approach to inquiry starts with small parts and attempts to establish connections with other parts leading to an understanding of the larger whole. Beginning with the whole, the system, or as much as we understand of it, and then inquiring into the part or parts of it to see how it fits and functions leads to a fuller understanding of the whole. Analysis of present conditions is necessary, but insufficient. The problem is that reality is more than appearances and focusing on appearances, the face value of evidence from our immediate surroundings, can be misleading. How do we think adequately about social issues, giving issues the attention and weight they deserve, without the distorting them? We can expand our notion of a social issue (or anything for that matter) to include, as aspects of what it is, both the process by which the issue has come to life and the broader interactive context in which it is found. In this way, the study of a social issue involves us in the study of its history (the preconditions and connections to the past) and the encompassing system. Remembering, “things change,” provokes us to move beyond analyzing current conditions and historicizing social issues, to project probable or possible futures. In other words, our inquiry leads to the creation of visions of possible futures. This process of inquiry, then, changes the way we think about a social issue in the here and now (change moves in spirals, not circles) in that we can now look for preconditions of a future in the present and use them to develop political strategies (i.e., organize for change). The fundamental parts of human nature include a need for creative work, for creative inquiry, for free creation without the arbitrary limiting effects of coercive institutions. Schools are continually threatened because they are autocratic and they are autocratic because they are threatened—from within by students and critical parents and from without by various and disparate social, political, and economic interests. These conditions divide teachers from students and community and shape teachers’ attitudes, beliefs, and action. Teachers then, are crucial to any effort to improve, reform, or revolutionize curriculum, instruction, or schools. The transformation of schools must begin with the teachers, and no program that does not include the personal and collective rehabilitation of teachers can ever overcome the passive resistance of the old order. Schools should places that enable people to analyze and understand social problems; envision a future without those problems; and take action to bring that vision in to existence. Social progress is enhanced when we rewrite the narrative of the triumphant individual working within the system into a story of the creation of self-critical communities of educators in schools (and people in society) working collaboratively toward transformative outcomes. People who talk about transformational learning or educational revolution without referring explicitly to everyday life, without understanding what is subversive about learning, and love, and what is positive in the refusal of constraints, are trapped in a net of received ideas, the common-nonsense and false reality of technocrats (or worse). Schools are alluring contradictions, harboring possibilities for liberation, emancipation, and social progress, but, as fundamentally authoritarian and hierarchical institutions, they produce myriad oppressive and inequitable by-products. The challenge, perhaps impossibility, is discovering ways in which schools can contribute to positive liberty. That is a society where individuals have the power and resources to realize and fulfill their own potential, free from the obstacles of classism, racism, sexism and other inequalities encouraged by educational systems and the influence of the state and religious ideologies. A society where people have the agency and capacity, to make their own free choices and act independently based on reason, not authority, tradition, or dogma. These remarks were presented immediately following Seixas’ presentation and prepared without the opportunity to read the text of his talk in advance. As a result, they are based upon the abstract circulated prior to his seminar and my understanding of Seixas’ perspective based upon his published work and our interactions as faculty members at UBC. E. Wayne Ross is Professor in the Department of Curriculum and Pedagogy at UBC. He has written and edited numerous books including: Critical Theories, Radical Pedagogies and Social Education (Sense, 2010); The Social Studies Curriculum: Purposes, Problems and Possibilities (4th Ed., SUNY Press, 2014) and Working for Social Justice Inside and Outside the Classroom (Peter Lang, 2016). He also edits the journals Critical Education, Workplace: A Journal for Academic Labor, and Cultural Logic. In this talk I argue there is a disconnect between the rhetoric and reality of democracy in North America that subverts traditional approaches to democratic education. The tropes that have historically dominated the discourse on democracy and democratic education now amount to selling students (and ourselves) a lie about history and contemporary life. Our challenge is to re-imagine our roles as educators and find ways to create opportunities for students to create meaningful personal understandings of the world. Education is not about showing life to people, but bringing them to life. The aim is not getting students to listen to convincing lectures by experts, but getting them to speak for themselves in order to achieve, or at least strive for an equal degree of participation and a more democratic, equitable, and justice future. This requires a new mindset, something I call dangerous citizenship. This week, in my course on secondary social studies curriculum, we discussed various ideological stances toward curriculum. Predictably, the issue of “neutrality” in social studies teaching came up. Indeed, my students reported that as part of their professional preparation in the UBC B.Ed. program they have been repeatedly told that teachers should always strive for neutrality in their classrooms, I disagree. Teaching (and curriculum) cannot be separated from politics. And, adopting the ideology of neutrality is to surrender agency and professionalism as a classroom teacher. The ideology of neutrality is based upon theories of knowledge and conceptions of democracy that constrain rather than widen civic participation and has consequences that include passive, rather than active, learning; representation of democratic citizenship as a spectator project; and ultimately the maintenance of status quo inequalities in society. Below is an excerpt from a recent paper I wrote with Kevin D. Vinson that takes up the issue. Ideology of Neutrality, or What Exactly Are We Protecting Students From? … Educators often eschew openly political or ideological agendas for teaching and schools as inappropriate or “unprofessional.” The question, however, is not whether to allow political discourse in schools or to encourage particular social visions in the classroom, but rather what kind of social visions will be taught? There is a misguided and unfortunate tendency in our society to believe that activities that strengthen or maintain the status quo are neutral or at least non-political, while activities that critique or challenge the status quo are “political” and inappropriate. For example, for a company to advertise its product as a good thing, something consumers should buy, is not viewed as a political act. But, if a consumer group takes out an advertisement charging that the company’s product is not good, perhaps even harmful, this is often understood as political action. This type of thinking permeates our society, particularly when it comes to schooling and teaching. “Stick to the facts.” “Guard against bias.” “Maintain neutrality.” These are admonitions or goals expressed by some teachers when asked to identify the keys to successful teaching. Many of these same teachers (and teacher educators) conceive of their roles as designing and teaching courses to ensure that students are prepared to function non-disruptively in society as it exists. This is thought to be a desirable goal, in part, because it strengthens the status quo and is seen as being an “unbiased” or “neutral” position. Many of these same teachers view their work in school as apolitical, a matter of effectively covering the curriculum, imparting academic skills, and preparing students for whatever high-stakes tests they might face. Often these teachers have attended teacher education programs designed to ensure that they were prepared to adapt to the status quo in schools. Anyone who has paid attention to the debates on curriculum and school reform knows that schooling is a decidedly political enterprise (DeLeon & Ross, 2010; Mathison & Ross, 2008a; Mathison & Ross, 2008b; Ross & Gibson, 2007; Ross & Marker, 2005a, 2005b, 2005c). The question in teaching (as well as teacher education and school reform) is not whether to allow political discourse in schools or whether to advocate or not, but the nature and extent of political discourse and advocacy. “The question is not whether to encourage a particular social vision in the classroom but what kind of social vision it will be” (Teitelbaum, 1998, p. 32). It is widely believed that neutrality, objectivity, and unbiasedness are largely the same thing and always good when it comes to schools and teaching. But, consider the following. Neutrality is a political category—that is—not supporting any factions in a dispute. Holding a neutral stance in a conflict is no more likely to ensure rightness or objectivity than any other and may be a sign of ignorance of the issues. Michael Scriven (1991) puts it this way: “Being neutral is often a sign of error in a given dispute and can be a sign of bias; more often it is a sign of ignorance, sometimes of culpable or disabling ignorance” (p. 68). Demanding neutrality of schools and teachers comes at a cost. As Scriven points out there are “clearly situations in which one wants to say that being neutral is a sign of bias” (p. 67). For example, being neutral in the debate on the occurrence of the Holocaust; a debate on atomic theory with Christian Scientists; or a debate with fundamentalist Christians over the origins of life and evolution. To rephrase Scriven, it seems better not to require that schools include only neutral teachers at the cost of including ignoramuses or cowards and getting superficial teaching and curriculum. Absence of bias is not absence of convictions in an area, thus neutrality is not objectivity. To be objective is to be unbiased or unprejudiced. People are often misled to think that anyone who comes into a discussion with strong views about an issue cannot be unprejudiced. The key question, however, is whether and how the views are justified (e.g., Scriven, 1994). “A knowledge claim gains objectivity…to the degree that it is the product of exposure to the fullest range of criticisms and perspectives” (Anderson, 1995, p. 198). Or as John Dewey (1910) argued, thoughts and beliefs that depend upon authority (e.g., tradition, instruction, imitation) and are not based on a survey of evidence are prejudices, prejudgments. Thus, achieving objectivity in teaching and the curriculum requires that we take seriously alternative perspectives and criticisms of any particular knowledge claim. How is it possible to have or strive for objectivity in schools where political discourse is circumscribed and neutrality is demanded? Achieving pedagogical objectivity is no easy task. The objective teacher considers the most persuasive arguments for different points of view on a given issue; demonstrates evenhandedness; focuses on positions that are supported by evidence, etc. The “ideology of neutrality” that dominates current thought and practices in schools (and in teacher education) is sustained by theories of knowledge and conceptions of democracy that constrain rather than widen civic participation in our society and functions to obscure political and ideological consequences of so-called “neutral” schooling, teaching, and curriculum. These consequences include conceptions of the learner as passive; democratic citizenship as a spectator project; and ultimately the maintenance of status quo inequalities in society. Cultural Logic has just announced an epic launch of three volumes of critical scholarship addressing a wide range of issues. Cultural Logic, which has been on-line since 1997, is a open access, non-profit, peer-reviewed, interdisciplinary journal that publishes essays, interviews, poetry, reviews (books, films, other media), etc. by writers working within the Marxist tradition. Volumes 2011 and 2012 were edited by David Siar. Volume 2013 is the open access version the Education for Revolution issue that was published by Works & Days in December 2013, which I co-edited with Rich Gibson. Thanks to everyone for your contributions, to David Downing and his team for publishing the issue in Works & Days, to David Siar for his editorial and site management, and to Joe Ramsey for suggesting the WD/CL collaboration for the Education for Revolution issue. The issue will be published this fall, in print, by Works & Days. Cultural Logic will then publish an expanded online version—including several additional articles, including pieces on Greece, India, and Turkey—in 2014. The core issue of our time is the reality of the promise of perpetual war and escalating color-coded inequality met by the potential of a mass, activist, class-conscious movement to transform both daily life and the system of capitalism itself. In this context, schools in the empires of the world are the centripetal organizing points of much of life. While the claim of capitalist schooling is, in the classics, education, “leading out,” the reality is that schools are segregated illusion factories, in some cases human munition factories. Rather than leading out, they encapsulate. Mainstream educational and social research typically ignores, disconnects, the ineluctable relationships of what is in fact capitalist schooling, class war, imperialist war, and the development of varying forms of corporate states around the world. At issue, of course, is: What to do? The long view, either in philosophy or social practice is revolution as things must change, and they will. Connecting the long view to what must also be a long slog necessarily involves a careful look at existing local, national, and international conditions; working out tactics and strategies that all can understand, none taken apart from a grand strategy of equality and justice. “Marxism and Education: Education for Revolution” will be the second collaborative publishing project between Cultural Logic and Works & Days. In 2012, the journals co-published the special issue “Culture and Crisis,” edited by Cultural Logic co-editor Joseph G. Ramsey) in print and online versions. Schooling For Capitalism or Education for Twenty-First Century Socialism? Rich Gibson is emeritis professor of social studies in the College of Education at San Diego State University. He worked as a foundry worker, an ambulance driver, a pot and pan washer, fence painter, soda jerk, bank teller, surveyor’s assistant, assembly line chaser, a teacher, a social worker, organizer and bargaining agent for National Education Association, TA, and as a professor at Wayne State University. With about ten other people, he helped to found what is now the largest local in the UAW, local 6000, not auto-workers, but state employees. E. Wayne Ross is professor in the Faculty of Education at the University of British Columbia and a former secondary social studies (Grades 8 to 12) and day care teacher in North Carolina and Georgia. He has taught at Ohio State University, State University of New York, and the University of Louisville. Ross is a member of the Institute for Critical Education Studies at UBC and co-editor of Critical Education and Workplace: A Journal for Academic Labor. Gibson and Ross are co-editors of Neoliberalism and Education Reform (Hampton Press) and are co-founders of The Rouge Forum, a group of K-12 and university education workers, parents, community people, and students, engaged in fighting for a democratic and egalitarian society. Find out more about The Rouge Forum conferences here and here. Cultural Logic—which has been on-line since 1997—is an open access, non-profit, peer-reviewed, interdisciplinary journal that publishes essays, interviews, poetry, reviews (books, films, other media), etc. by writers working within the Marxist tradition. Works & Days provides a scholarly forum for the exploration of problems in cultural studies, pedagogy, and institutional critique, especially as they are impacted by the global economic crisis of late capitalism. Whereas most scholarly journals publish groups of relatively unrelated essays, each volume of Works & Days focuses on a specific issue, and contributors are encouraged to share their work with each other. Recent special issues of the Works & Days journal have focused on the effect of globalization on women and the environment, the attacks on academic freedom, the privatization of higher education under neoliberal capitalism, the increasing exploitation of part-time, temporary faculty, the shift from print to electronic media, and the politics of knowledge. Works & Days is edited by David B. Downing (Indiana University of Pennsylvania). The “political spectrum” is a long time topic in high school social studies classes and the parlance of “left-wing/right-wing” is firmly embedded in the minds of most North Americans. However, the left-right dichotomy that is typically used to categorize political views in the media and elsewhere does more obfuscate than illuminate differences in political thought. In the USA the political spectrum has shrunk to the point that there is effectively no difference between Democrats and Republicans on economics, while there are a few, but only a few, notable differences on social issues. So if you watch Fox News, CNN, etc. you’ll see teleprompter reading pundits making mountains of mole hills when it comes to who’s on the left and who’s on the right—Alan Colms on the left? (At least we don’t have to endure Hannity and Colms any more on FoxNews, although Colms continues to pose on Fox radio). The terms “Right-wing” and “Left-wing” as applied to politics originated with the French government assemblies in the 18th Century, where the aristocrats sat to the right of the speaker and commoners (the bourgeoisie) to the left. The oversimplication of political thought to a single scale of left/right is what allows some Americans to actually call Obama a socialist. These folks are sincere in their beliefs about Obama, but the ancient Greeks would have called them called idiots (ἰδιώτης or idiōtēs)—seen as having bad judgment in public and political matters. Typically jejune public (and pundit) opinions about what constitutes the left and the right makes it difficult for folks to make sense of political positions that fall out of the narrow mainstream—Noam Chomsky and Ron Paul are examples of well known political figures who cannot be accurately characterized on the left/right political binary. 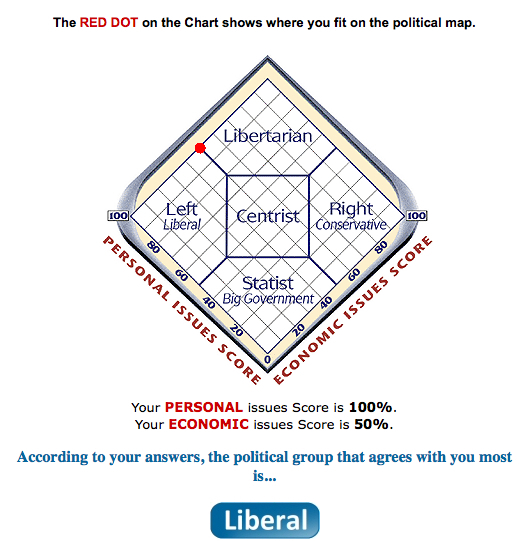 What’s at issue here is not just the accuracy with which we categorize political figures or political views. The left/right binary has the practical effect of forcing political discourse into artificial categories—every political disagreement becomes a two-sided argument, which is the typical cable news or local newspaper paradigm for political news coverage. This strategy works quite well in capitalist democracies, which cultivate the appearance of dissent, choice, and difference on political and social issues, while manufacturing consent amongst the public for policies designed to preserve the interests economic and political elites. The economic bailouts of recent months are a good example of this. 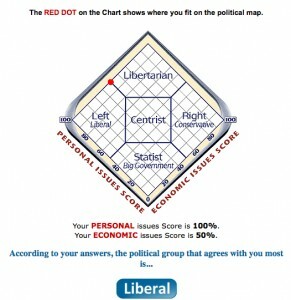 But the left/right binary also alienates, marginalizes, and confuses many people who fail to see a place for their own political views in the “objective” framework of what consitutes politics, so they do not participate (and I’m not talking about voting or elections, but the failure to image themselves as having political agency in the broadest sense of the concept). Despite a wide variety of models that can provide multidimensional images of political positions, discourse about the political spectrum in the media and many classrooms remains shallow and unidimensional. 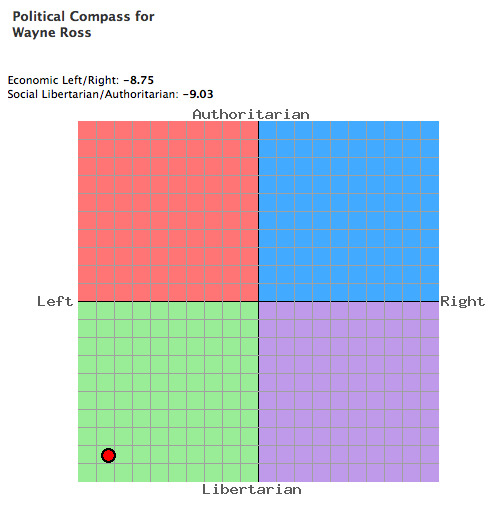 While models (and quizzes) like The Political Spectrum, Pournelle Chart, the Nolan Chart, etc. have their limitations, they can be useful pedagogical tools for teachers who want to encourage their students to think about politics beyond the oversimplified right/left divisions that dominate mainstream media (and this provides students with a good starting point for thinking critically about the MSM and the interests they serve). How Do I Keep My Ideals and Still Teach? This work is licensed under a Creative Commons Attribution-Noncommercial-Share Alike 2.5 Canada License.